Racist, sexist, homophobe, even nazi: these words have lost their power for many conservatives. They don’t believe that these words describe them. They experience this as name calling – part of an ongoing effort to undermine people on the right who have different values. Latte drinking liberal, femi-nazi, elitist: these are a few of the words that are used to dismiss people on the left. So now we are caught in a culture war where we are all losing. Losing friends, losing family, losing the ability to solve problems in a way that respects and honors the needs of everyone affected. How do we change this dynamic? Is there a way for us to tap into the kindness and goodwill that we’ve seen in friends across the political spectrum? What are your thoughts on Righteousness and Relationships? Do you want to have friends that hold viewpoints that are different from your own? Why is this kind of friendship valuable or not? How might we step out of the exclusively right/wrong paradigm to explore what’s really important to – and enlivens – us all? Have you ever chosen to let someone be “right” to preserve a relationship? 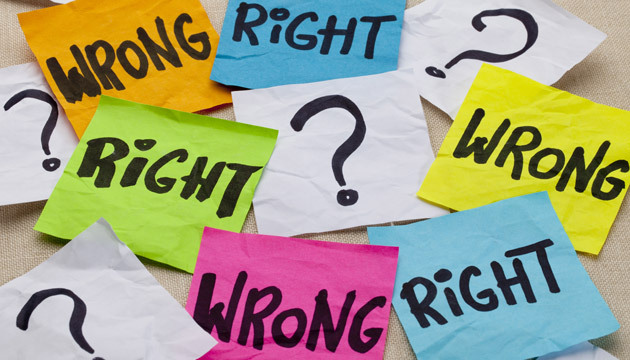 Have you ever insisted on being right with your opinion or facts? What happened? Are there specific topics or issues where you’ve decided what is right and are not open to new ideas?